Wood's Prairie, named after Zadock Woods (who was killed in the Dawson Massacre on 9-18-1842), is the area immediately west of the town of West Point and approximately 10 miles west of La Grange on Highway 71. Zadock Woods' home was used as a fort for protection of the settlers between 1828 & 1842. The cemetery was established near the fort in the 1830's. The site is located about 1/2 mile off Highway 71 on County Road 117 (Woods Prairie Cemetery Lane). To the right of the entrance gate, there is a large area where no markers were found but evidence of sand stones and rocks was present. There are probably many unknown burials here. Kathy Carter and Helen Muras of the Fayette Heritage Museum & Archives visited this site on January 25, 1993. This report was generated from the survey records and mapping done in 1976 by Mr. T. H. Johnson and by the visit on 1-25-1993. Norman C. Krischke visited and mapped the site on March 1999. Additional information had been added from his research. See his booklet, "Woods Prairie Cemetery," (99.12.3) in the cemetery files of the Fayette Heritage Archives. Zadock Woods (d. 1842), veteran of the War of 1812 and one of Stephen F. Austin's Old Three Hundred colonists, brought his family to settle in this area in 1828. He built a fortified home on land deeded to his son, Montraville, and established a cemetery here for his family and neighbors. The first burial is said to be that of a ranch hand. Another alleged early grave belongs to Stephen Cottle, brother of Woods' wife Minerva. He died c. 1828, and tradition holds he is buried north of his sister's plot; hers is the first marked grave, dating to 1839. Zadock Woods himself is not buried at the cemetery. Killed at the Dawson Massacre of 1842, he is buried at Monument Hill State Historic Site in La Grange, in a vault with others who fell with him. A veteran of the massacre who survived capture and then imprisonment in Mexico is buried here, though. That survivor, Joseph C. Robinson, lived until 1861 and was honored here with a Texas Centennial marker in 1936. Photos contributed by Pat Topping. Additional information can be found at Woods Prairie Cemetery Index, a site created by Jo White using information from Norman C. Krischke's booklet, Woods Prairie Cemetery. Woods Prairie Cemetery is one of the oldest cemeteries in Fayette County, and may date back as far as 1828. 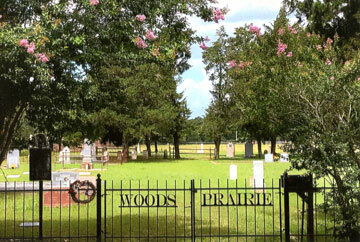 The name of the cemetery has always been Woods Prairie Cemetery. Woods Prairie was named for Zadock Woods and his family. Zadock Woods, a veteran of the War of 1812, was one of Austin's Old Three Hundred he was a veteran of San Jacinto. He had first come to Texas in 1823 from Missouri, went back, got his family and brought them to Texas in 1824. In 1828, he resettled his family in what is now Fayette County. He completed a fortified home for his family on land owned by his son, Montraville Woods. The home became known as Woods Fort, and was a refuge for women and children during troubled times. Zadock Woods created the cemetery near his home for the use of family and friends and neighbors living in the area. The cemetery is located about two miles west of the community of West Point and is one mile north of Highway 71. A Woods family historian alleges that Stephen Cottle, brother to Zadock Woods' wife, Minerva Cottle Woods, was visiting the fort in 1828, took pneumonia, died, and was buried in the cemetery. The grave is no longer marked but is said to have been near the grave of Cottle's sister, Minerva Woods. Minerva Cottle Woods' grave is the oldest marked grave in the cemetery. The first burial in the cemetery is said to have been a ranch hand working for Joseph C. Robinson. There is evidence of a grave in the far northwest corner of the cemetery. The actual date of the burial is not known. Many of the folks who are buried in Woods Prairie Cemetery were true pioneers. They were living in the area before and during the Texas Revolution and during the days of the Republic. The Woods family and others were in the Runaway Scrape. 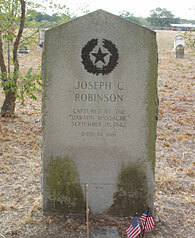 Among the graves in the cemetery is the grave of Joseph C. Robinson. He was captured at the Dawson Massacre 18 September 1842, was taken prisoner and finally released from Perote Prison 27 March 1844. He died in 1861, but had already enlisted for service with the Dixie Grays, a Civil War unit. His grave has a Texas Centennial Marker (1936). William Young, a veteran of the Mexican War and of the Civil War is buried in the cemetery, as are numerous Civil War veterans. On 25 October 1875, the cemetery land was bought by four men in order to formally designate it as a cemetery and to protect the graves therein. The land was fought from P. B. Faison for fifty dollars in gold. The land is out of the Montraville Wood Survey. The men who bought the land were: J. A. Darby, . E. Darby, T. C. Moore and A. W. Young. The plot measures 139 feet by 282.6 feet and is fenced. The cemetery property is deeded to the "heirs and assigns forever" of the men who bought the property, and has been lovingly maintained by the heirs. Many cemetery records were kept through the years by the families. T. H. Johnson of Plum, Texas, surveyed the cemetery during the late 1960s. It was last surveyed in 1999 by noted cemetery historian, Norman C. Krischke of Schulenburg, Texas. A copy of booklets prepared by Mr. Johnson and Mr. Krischke can be found in Fayette Public Library. There are also some unmarked graves in the cemetery. There area a umber of such graves along the north fence line and in the southwest corner of the cemetery. These are said to be the graves of Asian railroad workers who died during an epidemic (probably Yellow Fever), when the MKT railroad was built through Fayette County. 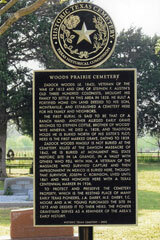 Woods Prairie Cemetery has been awarded the status of Historic Texas Cemetery Designation. A Historic Texas Cemetery medallion (plaque) has bee obtained and the dedication ceremony has been scheduled for November 1st, 2003. Paul Smith contributed the data on this page from his survey of the Woods Prairie Cemetery. Jo White added eleven additional names in 2012. Co B. 12 Ala Inf. C. S. A . Captured at the "Dawson Massacre" September 18, 1942. Died in 1861. 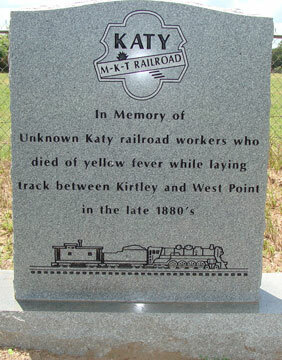 If you travel to the Woods Prairie Cemetery near West Point, TX you will find a M-K-T Katy Railroad Monument which was placed there by Bobbie Robbins Stevens in 2013 and paid for by her mother, Susan Grace Young Robbins. Susan had heard the story of the railroad workers all her life and had helped her Aunt Molly (Mrs. Charles Young) tend the graves when she was a child. It was Charles Young and his brother Zed (Bobbie Robbins Stevens' grandfather) who gave the railroad foreman permission to bury the men in the cemetery. The railroad workers who died earlier were buried in a field next to the railroad tracks near Primm, which was later renamed Kirtley. Zed Young lived west of West Point and owned several plots of land in the area. Zed had three children, two boys (Frank and Alf) and one girl (Susan). In his younger years he was a school teacher. Zed was a tall man, very heavyset in his later years, and always wore a mustache. Charles Young lived across the road from Zed on the south side of Hwy 71. He was a farmer and he also sold Watkins Products. He served as Fayette County Commissioner and donated the land for the roadside park on Hwy 71, which was the first roadside park in the state of Texas. Charles had three children, two boys (Allen and Will) and one girl (Ivy). Ivy married Jake Whitworth, who worked for the Katy Railroad. Zed had made a deal with the railroad to sell them timber from his land. These young white men were working with Zed Young cutting timber to make railroad ties. They came from different parts of the country and were working their way West. These young men died of Yellow Fever in the late 1880s while laying track between Primm and West Point and were buried in the cemetery at the site of the present-day marker. No individual markers were previously placed at the site, because in the 1880s no burial records were required and markers were expensive. It wasn't until 1903 that burial records were required by Texas law. There was research done at the cemetery in 1999 by Norman C. Krischke. He published a booklet on the history of the Woods family and the Woods Prairie Cemetery. You can find the booklet at the Fayette Public Library.